For the past year, I’ve seen a slow, but noticeable, downward trend in my attitude toward my career. There are certainly things I like about it, but I don’t get joy out of it like I do with other things. Every day has turned into a struggle to drag myself into the office. Every day, I have to convince myself to go in, that I need the job, the paycheck, the stability. And every day, I feel the happy drain out of me a little bit more. It’s possible this came about when one of my superiors recently acted like I was the second coming of Albert Einstein because I fixed the margins on a memo. Because I’m smarter than that, dammit. I’m worth more than marginal shortcuts. So naturally, I blame creativity. I grew up with dance. It was never something I thought I could pursue. It was merely a hobby, something to keep me active. It wasn’t until I returned to dance after a seven year hiatus that I realized how much I needed that artistry to keep me going; that churning out a 9-to-5 job, week after week, just wasn’t cutting it for me. Last year, my body finally told me to cool it so I gave up dance to recover. By then, I had been writing here for about a year so I had this community to help me fill the creative void left by quitting dance. But not even that could help me be happy with where I am in my life. Because I still have to spend 40+ hours a week in a place I’m not sure I want to be for the rest of my life. Perhaps this is my privilege, Generation Y, or some entitled combination of both talking but I feel as if I deserve more; that all of us deserve more than a job we put up with to scrape by each and every week. We all deserve to do what we love, right? But when I talk to friends and family about my hope of one day finding my happy by doing what I really want to do, I see their eyes glaze over and the glances back and forth as they question my sanity. Yes. I am. Because I can’t go through this life fixing margins on memos. Well, unless those margins are on the next novel I plan to publish. So how do the creatives push that doubt away? How do we convince those we care for most that this is serious? This isn’t some phase we’re going through where you just have to wait for us to get bored and move on. This is who we are. This is us finding our happy. Our happy just happens to come through a creative spark. Sure, it’s unconventional and hard as hell to make a reality, but why should that force us to stop searching for it? Hopefully, the answer is it shouldn’t. So I won’t. I’ll work on my doubt while searching for the elusive happy. Because one day, I’m going to be able to wake up and enjoy what I do each and every day. One day, my happy will be staring me right in the face each morning. Why? Because I deserve it. We all do. And I have to keep believing in that. I’m right there with you. Some days are rewarding, but most I find myself slamming my face against the “glass ceiling” feeling only pain and frustration for 1. Not breaking through 2. Life choices that put me under the ceiling and 3. Settling in life. I’m sorry you feel this frustrated. I feel this so much. Or at least I did before I got laid off. Go after your dreams. Do not wait. I say run after your dreams, as fast as you can. Eventually the people we love most will get on board and realize that this isn’t just a phase or a whim or something we’re doing because we’re bored. It’s our calling, and passion, and exactly what we were put on this earth to do. I am with you! God, if all I had was this job, (and don’t get me wrong, it is a wonderful firm and I value it) I might go insane. Five years ago, I told Paul I was going to start a blog and he looked at me as if I had a snake on my shoulder, but here I am still writing and that is enough to get me through the 40 hour work week. The key is convincing yourself, not anyone else. It’s funny how we don’t realize how much creative outlets do for us while we’re doing them. I went on a 10 minute haranguing of my barber when she said that my partner was the more creative of the two of us. I mean, I hauled off on her listing everything creative I’ve ever done. I apologized later, but it took her saying that to me to realize how important it was that I created. I honestly had no idea until I returned to dance. Now I’ve found all these other creative outlets that really keep me going each day. How do people live without it? Now’s the time to make the changes and find your happiness. My options changed when I became a mother. I don’t know if that’s in the cards for you and I don’t mean to sound like I have regrets. I don’t, actually, because I took advantage of my young and single days to try new things and pursue dreams. Yup, I could have written this same post, too. I suppose the only way we get through our 9-5s is with the promise (hope?) that eventually we WILL get to do what we love for a living one day, because if not, then unfortunately I don’t believe much is “worth it.” I also feel like I deserve better, but maybe I shouldn’t feel like I deserve it because I certainly don’t feel like I am working hard enough toward it. You’ve given me a lot to think about with this post, Arden. Thanks! Glad I made you think! Haha. The doubt gets me. I’m get so scared when I’m nearing the end of a project because I’ll know I have to put it out there. Got to find a way to get over that or at least just push through it! I’m with you, sistah! Just try to remember that first drafts are always crap (if you’re talking about novel writing). Don’t let the first draft bring you down. 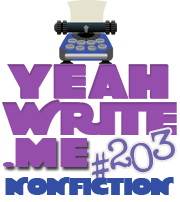 You’re a great writer as evidenced on yeah write! I have a feeling you will go far.